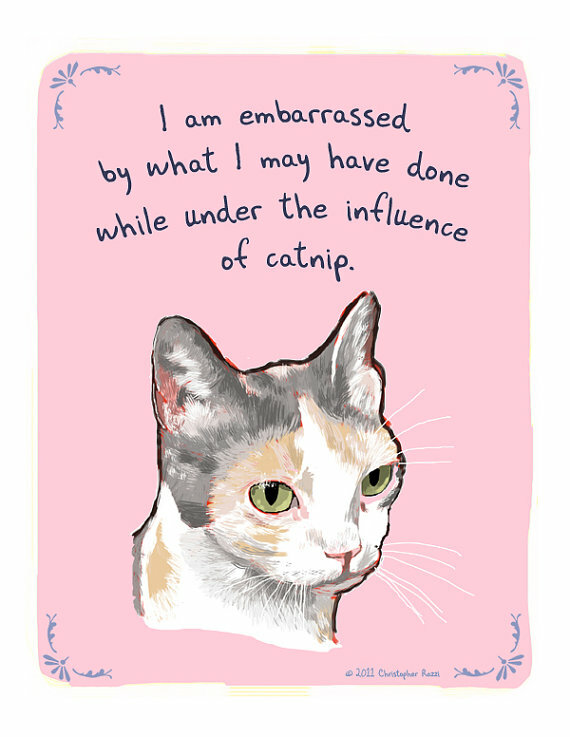 Catsparella: Tiny Confessions 8x10 Cat Print Giveaway! 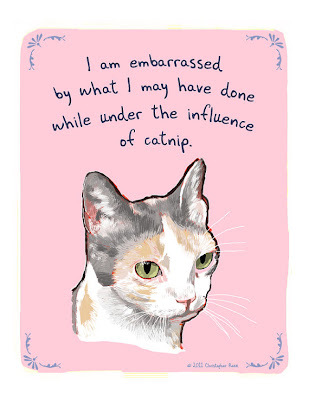 I am embarrassed by what I may have done under the influence of catnip. Chris Rozzi is a creative jack-of-all-trades. The artist, writer, and comedian lives in New York City, and started his Tiny Confessions Etsy shop as a way to combine his passion for comedy and art. So what are tiny confessions? Rozzi creates little paintings of cats (and dogs, monsters, and more) revealing their sometimes silly, and sometimes poignant innermost thoughts. 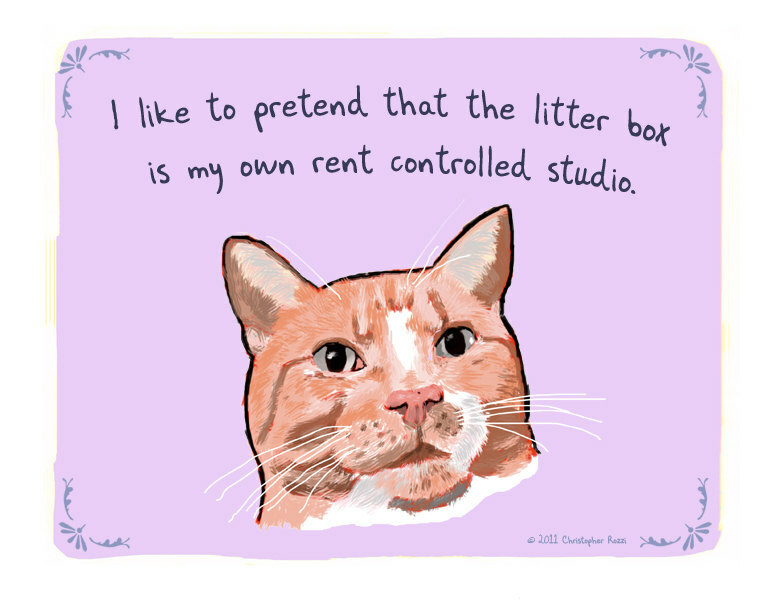 Most cat owners will agree that their kitties have some complex thoughts going on in between those little ears, and Rozzi's interpretation of those ideas are spot on. From the kitty who secretly roots against your sports teams, to the one who keeps knocking your phone off the table just for kicks, you're likely to see a bit of your own cat in one of his comedic creations. In the off chance that you don't see your feline represented in his work, Chris is open to switching pictures with phrases, or will even whip up a custom tiny confession of your (cat's) very own. Along with numerous options currently available in his Etsy shop, he also tells me that he just finished up a batch of brand new designs that will go on sale next week at Fab.com. 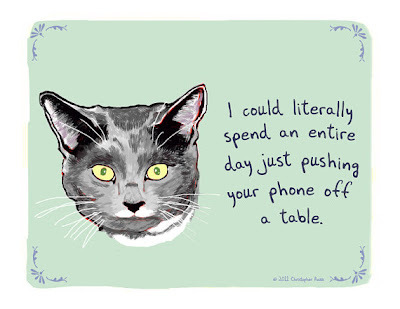 I could literally spend an entire day just pushing your phone off a table. 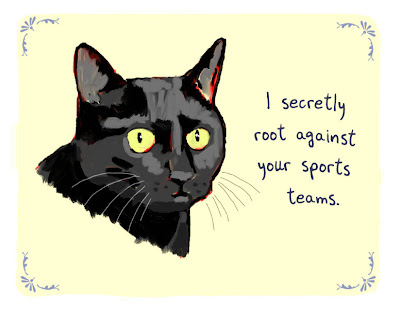 I secretly root against your sports teams. 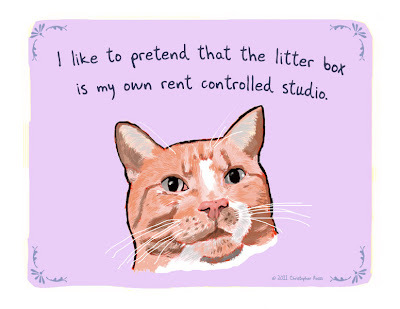 I like to pretend that the litter box is my own rent controlled studio. Chris has generously offered one lucky Catsparella reader the chance to win an 8 x 10 Tiny Confessions Cat Print of their choice! (You can select one of the prints featured in this post, or browse the rest here). To enter, leave a comment on this post with your name and some way for me to contact you (email, link back to your blog or profile, Twitter, etc. ), along with which print you would like to win. The winner be will chosen in a random drawing next Tuesday, May 29th at 5:00PM EST. This giveaway is open to everyone, so our international friends can participate too. One entry per person, please. Good luck, and be sure to visit the Tiny Confessions shop, and follow Chris on Facebook for all of the latest updates on his newest designs and upcoming events!